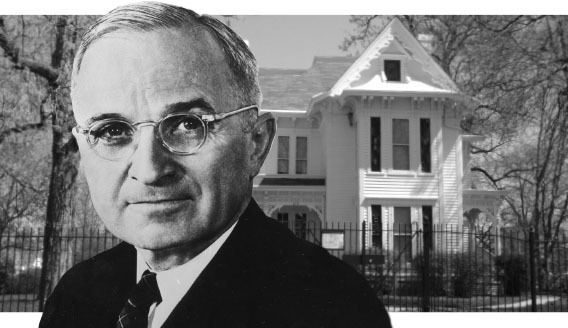 Visit the places that shaped the life and character of Missouri’s favorite son and America’s 33rd President, Harry S Truman. Made up of five houses in Independence and Grandview, Missouri, this National Historic Site features locations important in the early adult, pre- and post-White House years of Harry and wife Bess, including their cherished “Summer White House”—a grand white Victorian home—and the farm home and grounds of Harry’s maternal grandmother. Throughout a career that took him from farmer to bank clerk, judge to senator, Vice President to President of the United States, Harry S Truman was always a Missourian at heart. 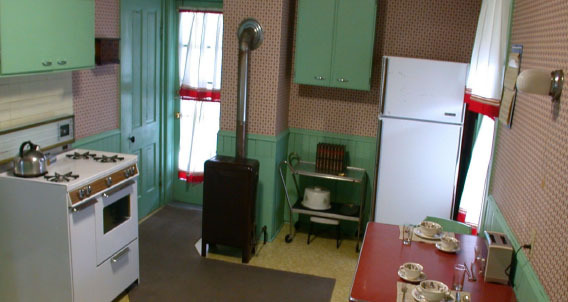 At Harry S Truman National Historic Site, you can experience many of the places he held most dear. Harry’s legacy is forever linked with his hometown of Independence, MO, just east of Kansas City. There in Sunday school, six-year old Harry met five-year old Elizabeth “Bess” Wallace, the pretty, athletic girl who would become his First Lady over 50 years later. As a young man, he lived on the family farm in Grandview, MO. But he would often visit his cousins, the Nolands, who conveniently lived across the street from Bess’ family home. During their courtship year, which began in 1910, Harry and Bess often triple dated with Bess’s brothers and their future wives, who eventually built small homes behind their larger family home. You can see all of these locations when visiting the Historic Site. After Harry graduated high school in 1901, his father’s bad investments forced Harry to abandon his dreams of a college education. Instead, he became a bank clerk in Kansas City and joined the National Guard. At age 22, his father called him to help on the family farm. And the avid reader and pianist learned the hard realities of 14-hour days of backbreaking labor. You can see where Harry learned his characteristic perseverance and common sense with a self-guided grounds tour of the Truman family farm in Grandview, a 20-minute drive from the Visitor Center. His farming years were a disappointment for Harry. Although he and Bess became secretly engaged in 1913, Harry wished for a secure income before marriage. He spent another four years engaging in failed attempts to strike it rich. In 1917, Harry joined the military. In World War I, he served as a Captain in the U.S. Army, leading the 129th Field Artillery, 35th Division’s operations in France. After, he returned to Independence in 1919 and, despite his lack of wealth, he and Bess married. The couple moved into Harry’s home at the farm, but returned to Bess’ family home, the large white Victorian at 219 N Delaware, to care for Bess’s ailing mother. Their daughter Margaret was born there in 1924. Ten years later, the family moved to Washington D.C. when Harry was elected to the Senate. In 1944, President Franklin Delano Roosevelt selected Harry to serve as Vice President for his unprecedented fourth term. But Roosevelt died within three months of the inauguration, thrusting Harry into world leadership during a tumultuous time that saw the use of atomic bombs against Japan, the end of World War II, the Korean War, and start of the Cold War. Yet his presidency was not marked solely by conflict. Drawing on his Midwestern values of hard work, honesty, and fairness, Harry ordered the desegregation of the military and ushered in a domestic policy called the Fair Deal. After nearly eight years in office, “the People’s President” returned home to Independence, where he and Bess lived out their days. Visitors can tour the all-original Truman Home, follow in Truman’s footsteps with a walking tour of his neighborhood, visit the family farm in Grandview, explore exhibits about his private life in his cousins’ Noland house, and review the oral histories from his colleagues and family. A collection of sites make up the former President’s home. Here you will find the authentically-furnished Truman Home, the historic Truman Farm and the delightful Noland Home. A glimpse into presidential family life, the Truman Home displays objects from the museum collection of over 57,000 artifacts and personal possessions of Harry S Truman, creating one of the most authentic presidential site experiences in the National Park Service. As a young boy, Harry Truman had three main interests: music, reading, and history. Truman understood that you never stop learning. Today, children ages 5-12 can participate in the Junior Ranger program.